Saturday is obedience class day for the lovely Freya. I consider group training classes a lifelong activity for my dogs, and I’m always happy to find those classes, clubs and instructors that can make those classes a good experience for both me and my dogs. We like our current class very much. It is an intermediate/advanced class, which means some of the dogs are fresh out of beginner class, some are more experienced and some are working on off-lead or competition. Class size is small: 10 dogs when everyone is there. We use mostly positive training with food and praise, but correction collars and corrections are not forbidden. After owning six rather stubborn Rottweilers, I no longer believe that all dogs can be trained solely with pure positive methods. If you do, that is fine, and we will just have to agree to disagree. What I really like about our instructor is that he is able to help reactive and unruly dogs work in class, without undermining the experience for the other dogs. The hall is large enough to provide enough space for dogs to work at a comfortable distance. Over the past few weeks, an extremely reactive dog has gone from working outside the group at one edge of the training room, slowly moving closer to the group, to being able to work with the group for at least half the class period now. Freya is reactive herself to small hyper dogs, so this has also been a good opportunity to get help in teaching her to work through what to her is a huge distraction. This has been so much better for me than having to rely on random public encounters where I have no control over the skill or intelligence of the other dog and its handler. I need to set up some specific training goals for Freya, and make them more real by picking out some actual trial dates to shoot for. She is a pretty smart dog whose lack of working titles is due mostly to my own procrastination and somewhat weak dog training skills when it comes to competitive obedience. I am so glad there is such a thing as Rally Obedience now. When our first Rottweiler Heidi came to live with us in 1994, the sport did not exist. All of our Rottweilers go through obedience classes, and we actually did trial with Heidi and her little brother Oscar, but never did title them. Traditional obedience competition demands a lot of precision, which is something I am terrible at. Rally Obedience requires the same routines and exercises as traditional obedience, but it is more relaxed for both dog and handler. This I can probably do, so this is what I will work towards. My real dog sport love is Schutzhund, but I don’t know if I will ever get back to it. It requires even more commitment in training time and practice time than many other dog sports. Since it involves a protection component, you really cannot do this without a club with an experienced and safe helper. With the current legal climate for all dog owners, there is a particular responsibility for dog owners participating in protection sports and unfortunately, that is not something that can be ignored these days. Did I not mention Axel yet? No, apparently I did not. I am still deciding on what his activities should be while he is taking a break from conformation showing. We were doing private lessons before he left in December, and I’m not opposed to continuing those, but I also feel he needs to get back into group classes so he remains accustomed to seeing dogs of different breeds on a regular basis. I won’t even think about working titles for him until after he completes his championship. Freya went to the vet today for her annual immunizations and checkup. She is a favorite at the clinic and basks in the adoration of the staff whenever she visits. She received a clean bill of health, except for the approximately 10 pounds she has put on since she was spayed 2 years ago. She weighed in at 92 pounds today. Her ideal weight is somewhere between 82-85 pounds, which is how much she weighed the last time I showed her, and on her spay date. It is apparently not a myth that a dog’s metabolism may slow down somewhat after spaying or neutering. 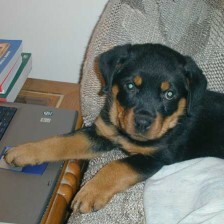 However, that did not happen with any of my prior Rottweilers, so this is a new experience for me. I’ve had much more experience putting needed weight on a dog, rather than taking it off. Quite honestly, I could stand to lose about the same amount of weight, so the first thing we’ll do is add some walks of the exercise type rather than the wandering type. I don’t want to cut back on Freya’s food, nor change it right now. She gets 2-2.5 cups a day, which according to the vet’s calorie analysis today, would be about right for her current food. She has a very mild case of IBS, and after one entire summer of experimenting with many different foods to find one that worked well for her, I’m not eager to repeat the process. One thing we’ll have to do is cut back on the treats. Like most Rottweilers, Freya is extremely food motivated, so training time involves treats as well. This is not going to go over well. To add to the fun, Axel needs to put on a few pounds during his break from the show circuit. I have always hated that whole deal where show weight is about 10-15 pounds heavier than working weight for a typical adult male Rottweiler, but I have to admit that he does look good at his show weight. Wouldn’t it be great if there was a canine fat transformer, so I could just take those pounds off Freya and give them to Axel? Nothing for Axel at today’s show, so please hope with me for at least one day of Axel love on Sunday. He’ll be home either Sunday or Monday, win or lose, and then I win since everyone’s home again!